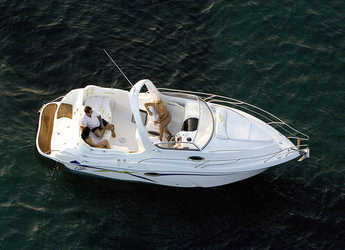 Showing 4 from 4 available Motorboats for rent in Almeria on your selected dates. Almeria, the capital city of the Almeria province in South Eastern Spain, is the home of timeless castles, museums, beaches, and coves. The total Almeria holiday experience also includes shopping trips and the local cuisine. Although Almeria is not a very popular tourist destination, it has received quite a number of tourists over the past years. Activities which tourists enjoy include trips to museums and castles, the different array of beaches and coves, and the archaeological sites that give Almeria a special architectural appeal. Tourists to Almeria especially enjoy the numerous beaches and coves along the 200 km coastline. Boat trips and excursions are some of the activities which tourists schedule to the secluded coves surrounded by hills and castles. With a rented boat, tourists enjoy more intimate and family-friendly moments which make holidaying in Almeria all the more special. Some of the major attraction sites for tourists are the Almeria fortress, Almeria Cathedral, and the Alcazaba. With a combination of desert, fertile land, and numerous beaches, Almeria provides a lot of options for tourists. Almeria is also very accessible. You can fly in directly to the Almeria airport or come in from Granada or Malaga airports. The appeal of Almeria is in its sites, food, beaches, and endless cliffs and reserves. There is always something to see and eat in Almeria. The numerous beaches and coves of Almeria provide a lot of activities for tourists and visitors. Whether you prefer a dip in the Mediterranean Sea or a boat trip to explore the hidden coves, Almeria offers perfect destinations. Monsul beach in Almeria is one of the sailing hotspots for tourists, especially those with families. This beach is located within the Natural Park of Cabo de Gata. Its natural shelter, a lava formation, also keeps tourists away from the rays of the sun. This beach has also hosted some movie productions; it was featured in some of the scenes in Indiana Jones. Aguadulce beach is also one of the sailing hotspots in Almeria. This beach is home to a lot of activities, and with the surrounding Spanish restaurants, you can also enjoy the local cuisine in all its specialty. Los Genoveses Beach is another beautiful natural endowment that lines the coast of Almeria. This wide expanse of natural water attracts a lot of windsurfers and swimmers yearly. It is also a perfect location for a boat trip as it is a natural cove that is not accessible by car.